On Wednesday, September 23, Pope Francis was in Washington, D.C. He first went to the White House to be welcomed to the U.S., held a midday prayer service with the Roman Catholic Bishops of the U.S. and conducted the Junipero Serro canonization mass. After the mass, Francis made an unscheduled stop at the Little Sisters of the Poor residence. About 15,000 people were gathered on the south lawn of the White House for the welcoming of Pope Francis to the United States preceded by historic American music. 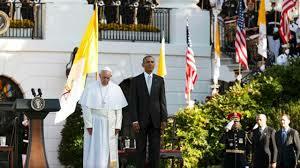 To the left is a photograph of the Pope and President Obama before they made their remarks. The Pope and President Obama with an interpreter then held a private meeting in the Oval Office of the White House, the details of which were not publicly released. Afterwards the Pope in the popemobile then waved at the crowds of people attending the Papal Parade around the Ellipse and the National Mall. At St. Matthew’s Cathedral, Pope Francis participated in a prayer service with U.S. bishops of the Roman Catholic Church and made the following lengthy remarks (in English translation). Pope Francis entered the Basilica of the National Shrine of the Immaculate Conception on the campus of the Catholic University of America to raucous cheers and applause from more than 2,000 men and women studying to become priests and nuns. Afterwards the Pope went outside the Cathedral for the open-air mass attended by the 25,000 people who had tickets, including Vice President Joe Biden and many Latinos. The photograph at the left shows the Pope at the mass. In his native Spanish (below in English translation), offered the following homily. “The reason we are here today is that many other people wanted to respond to that call. They believed that ‘life grows by being given away, and it weakens in isolation and comfort’ (Aparecida Document, 360). We are heirs to the bold missionary spirit of so many men and women who preferred not to be ‘shut up within structures which give us a false sense of security… within habits which make us feel safe, while at our door people are starving’ (Evangelii Gaudium, 49). We are indebted to a tradition, a chain of witnesses who have made it possible for the good news of the Gospel to be, in every generation, both ‘good’ and ‘news’”. Later Jesuit Father Federico Lombardi, the Vatican spokesman, told journalists that the papal visit was intended as a sign of support for the Little Sisters’ lawsuit against the Obama administration’s mandate that all employers offer contraceptive coverage in their health plans or participate in a religious “accommodation” that the sisters have refused. White House, Remarks by President Obama and His Holiness Pope Francis at Arrival Ceremony (Sept. 23, 2015); Read Pope Francis’ Speeches to the White House, the Bishops and Congress, Word on Fire Blog (Sept, 25, 2015); Reuters, On White House Lawn, Pope Urges U.S. Action on Climate Change, N.Y. Times (Sept. 23, 2015). 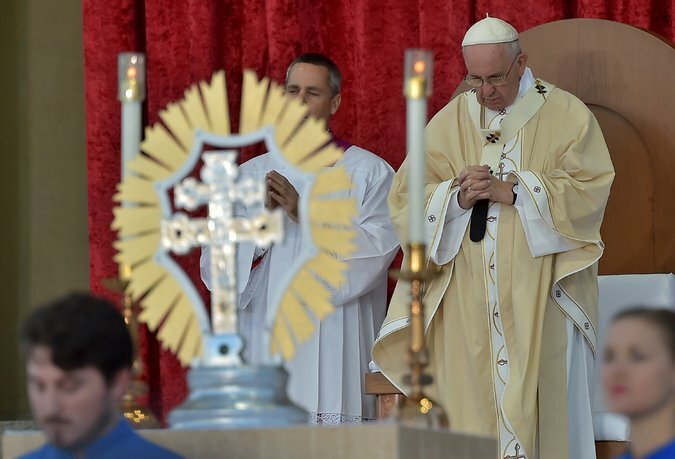 Pope Francis’ Homily at the Canonization Mass for the Rev. Junípero Serra, N.Y. Times (Sept. 23, 2015); Santos, Pilgrims Gather in Washington to See Pope Francis Canonize Junípero Serra, N.Y. Times (Sept. 23, 2015); Assoc. Press, Pope Canonizes 18th-Century Missionary; Not Everyone Happy, N.Y. Times (Sept. 23, 2015). 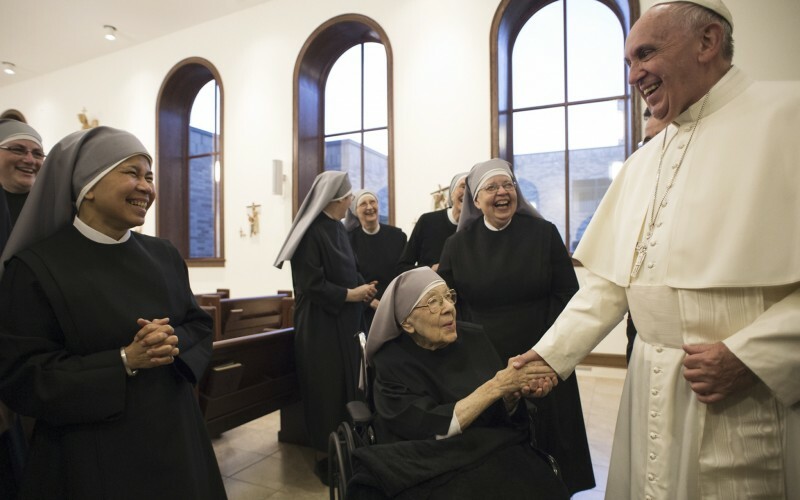 Hadro, Pope Francis made surprise stop at Little Sisters of the Poor to show support, Cath. News Agency (Sept. 23, 2015).